We're putting off Final Four Friday for a week to examine the thing MSU and Notre Dame are playing for Saturday: The Megaphone. The Megaphone trophy is a college football institution, begun in 1949 and handed out annually to the game's winner. The trophy is jointly sponsored by the Detroit alumni club of MSU and Notre Dame. Half of it is blue, half is green, and it sits on a base so you can't actually talk through the thing. 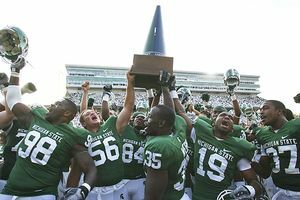 Unlike the three other trophies MSU plays for, however, they're not actually going to be presenting the original Megaphone on the field. Instead, the trophy MSU's 2008 team is holding aloft in the picture at left is the third such megaphone. Each score is printed on the trophy and they've run out of room twice, hence the three trophies. However, the schools do take possession of all three trophies between games. Notre Dame is one of four trophy games Michigan State plays (the others are Indiana, Michigan and Penn State). Notre Dame has five trophy games (USC, Purdue, Boston College and Stanford are the others). The Irish have dominated the series with Michigan State, 44-27-1 since the Megaphone was introduced. The Irish won it in each of their first eight tries, and 15 of the first 17 times. However, MSU has owned the series of late, winning nine of the last 12 games (including the last six away contests). Here's hoping those winning ways continue.